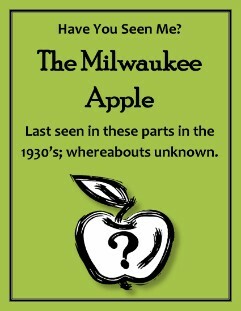 The Milwaukee Apple—just one of hundreds of endangered fruits that have disappeared from our plates and have been replaced by fewer than a dozen commercial varieties. Slow Food WiSE joins the handful of orchardists and chefs who are bringing antique apples back to our tables by adopting the Milwaukee Apple. Slow Food WiSE has planted 5 Milwaukee Apple Trees in Milwaukee County over the past two years. 4 trees, along with Pewaukee and Oneida Apple varietials, were in the spring of 2010 at the Historic Stahl Conrad Homestead in Hale’s Corners to bring this fruit back to our region. There is just one known Milwaukee Apple tree within the city limits—along with a group of youth and volunteers, Slow Food WiSE planted a bench graft Milwaukee apple tree in The Urban Ecology Center’s Washington Park fruit orchard. In 2012--we are bringing Milwaukee, Pewaukee, Oneida, Bonnie's Best, Wolf River--all apple varietals with roots in Wisconisn--to backyard growers. This seedling apple was found under a Duchess tree and then developed by George Jeffrey of Milwaukee, WI. It appeared in commerce around 1899. Its tough but thin skin is greenish yellow and marbled, dotted or blotched with reds. Its yellowish white flesh is tender and juicy, with a pleasant acid flavor good for most uses except as a fresh dessert apple. You can help recover forgotten fruits!